Opening hours: 10am – 5pm daily, 10am – 6pm Sat, Sun & Holidays April – October. Whether you have one eye on the past or one eye on the future, there’s plenty to admire in this expansive, interactive and unique museum. 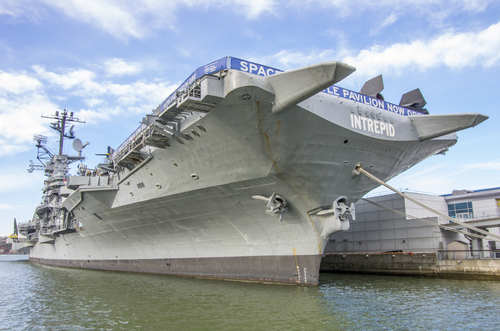 You’ll get the sense that this is a museum unlike any other from the moment you step on board; it’s all contained on a genuine aircraft carrier docked permanently at Pier 86. The Intrepid saw action during the Second World War, including being on the receiving end of torpedo strikes and diving Kamikaze planes. As much of the interior as possible has been kept exactly as it was, giving you an up-close-and-personal feel for how life was as a sailor living on board during the war. If you’re happier above deck, you can inspect the fleet of helicopters and fighter jets which are lined up for your viewing pleasure. If you can cope with enclosed spaces, though, you can climb inside ‘the Growler’, the only US missile submarine available for the public to enter. Be warned; it’s cramped! There are broader horizons on offer here too; the Intrepid hosts a Space Shuttle Pavilion with the best collection of NASA equipment outside of the Kennedy Space Center, including NASA’s famous orbiter, the Enterprise. It’s been parked here ever since the 1960s, and contains films, photos and technology that explain how we touched the stars before we invented the home computer.